When fresh cranberries appear on the shelves of your local grocery store, that’s your cue to make comfort food – to wit, this tasty dessert recipe. The combination of honey-poached pears, pecans and cinnamon will warm the cockles of your heart this fall! Place the rack in the middle of the oven. Preheat to 375°F. Slice the pears in half. Using a tablespoon, make a hole in the middle of the pear. Place the pears on a baking sheet so that the skin of the pear is touching the baking sheet. 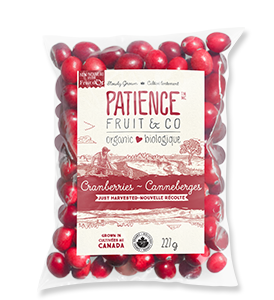 Place 3 cranberries in the centre of each pear with 7.5 ml (1/2 tablespoon) of chopped pecans. Sprinkle with spices and pour honey over each half. Bake in the oven for about 25 minutes or until the pears are tender. Available from late September to late December, fresh cranberries are not strictly limited to being used in sauces or alongside poultry. You can also try them in a smoothie, or dip them in chocolate.